EPISODE AIRED SEPTEMBER 13, 2004 AT 8 P.M.
Monday, September 13, 8:00 p.m.
"Pretty Boy Floyd Handgun—A man in La Verne, California, owns a vintage Colt automatic handgun, which family legend suggests once belonged to the Depression-era desperado, Charles 'Pretty Boy' Floyd. According to the legend, Floyd gave the gun to the contributor's uncle who had served as the lookout for 'Pretty Boy.' To find out if the story behind the gun is true, History Detective Wes Cowan travels to California, Oklahoma and Missouri. In the process, he discovers why gangsters became heroes to the rural population of the Midwest and reveals the true story behind the dramatic rise and fall of a man who ranks alongside Bonnie and Clyde and John Dillinger as one of the most colorful bank robbers in American history. " From the Bolivar Herald-Free Press, June 4, 2004, page 1-A. The Polk County Genealogical Society turned into a television studio for a few hours Wednesday morning. The renovated first floor of the building will be the back drop for a segment for the public television series "History Detectives." The series utilizes local genealogical societies, historical societies and other sources of historical information to reveal the historical significance of artifacts, buildings and legends from cities and towns across America and answer mysteries. The segment filmed in Polk County centers around a family legend submitted to the show by Richard Kee of La Verne, Calif. Kee owns a vintage Colt automatic handgun, which family legend suggests once belonged to Charles "Pretty Boy" Floyd. According to the legend, Floyd gave the gun to Kee's uncle who lived near Sentinel in northeast Polk County. As a teenager he acted as the lookout for "Pretty Boy," whose car had broken down on his desperate, final flight from the FBI. "Our research involves finding authorities on the question or part of the question," associate producer Courtney Engelstein said. "We try to find the most knowledgeable and relevant people whose expertise make them experts on a story." Engelstein contacted Polk County Genealogical Society President Susan Sparks for more information about Floyd's involvement in the Polk County area. "I said I would get back to her in a week or two but she said no, I need it right away," Sparks said. Sparks began the search for information about Floyd and the kidnapping of former Polk County Sheriff Jack Killingsworth in 1933. 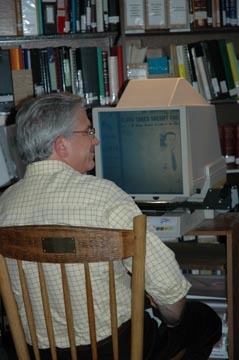 Wes Cowan looks at newspaper microfilm of the story. Floyd took Killingsworth hostage after Killingsworth walked into the local Chevrolet garage in Bolivar. Floyd and Andy Ricchetti brought the car to the garage after it broke down on their way to Kansas City. Sparks gathered 1930s newspapers clippings from the kidnapping and old county maps showing the route Floyd took to Kansas City. "Susan Sparks has been key in the investigation of the story," Engelstein said. 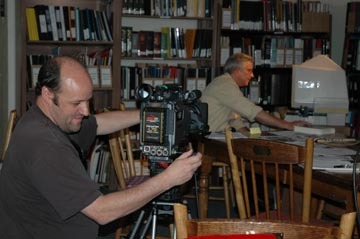 The cameraman Simon Fanthorpe gets ready to film. the Polk County portion of the segment. The final product will be around 14 to 17 minutes long, producer Candice Weiner said. The production crew also traveled to Oklahoma and California in their investigation. The segment will air during the series' second season set to debut this month on PBS. The Floyd mystery is scheduled to air this fall, Engelstein said. "History Detectives" airs at 8 p.m. Mondays on PBS.